I think I just found my dream bathroom! 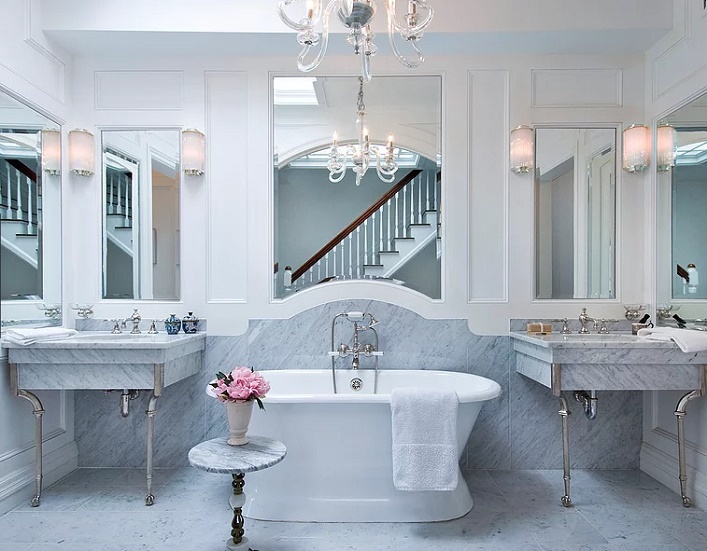 This gorgeous bathroom designed by the talented Jeffrey Delvy is absolutely swoon-worthy! I love the way he incorporates the classic carrara marble in a delightful, unexpected way. The graceful lines of the curved marble tiles immediately draws your eye to the bathtub, the focal point in the room while the marble sinks exude immense style and elegance. The designer's restrained use of color and accessories truly help the marble elements shine. The custom inset mirrors help to bounce light in the room, creating a bright and airy feel. The stunning chandelier is the icing on the cake, enhancing the beauty and elegance of this space. 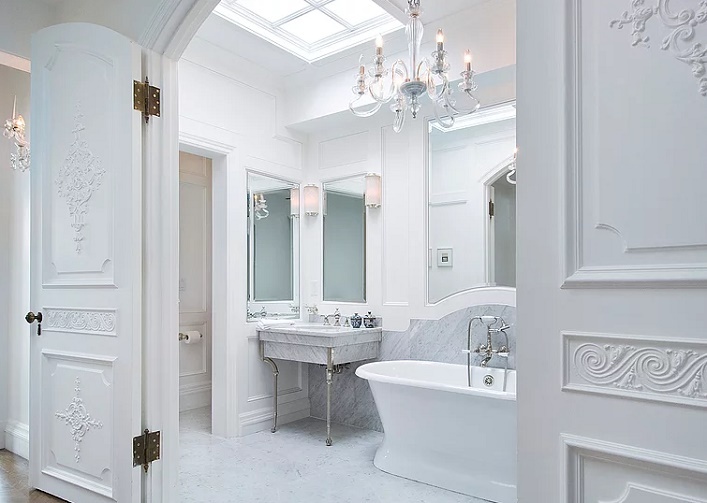 This chic, luxurious and timelessly beautiful bathroom with thoughtfully designed features is truly unforgettable and inspirational. Do you find this room as inspiring as I do? I would love to know your thoughts! Yes, it's beautiful in it's classic simplicity. The one thing I'd do is put dividing panels around the tub. I feel it's in an awkward space between the sinks. I'd rather have it elsewhere and maybe a beautiful vanity between the sinks. Gorgeous! A classically beautiful space gets me every time!